‘Girl Behind the Bottle (Jean Patchett),’ New York, 1949. Platinum/palladium print made 1978, 18 9/16 x 17 7/8″, Edition of 33. Gift of the artist, 1988. The exhibition is guest-curated by Merry Foresta, who was the museum’s curator of photography from 1983 to 1999, and who organized the 1990 SAAM exhibition in collaboration with the National Portrait Gallery, “Irving Penn: Master Images.” In the subsequent twenty-five years, Foresta and SAAM director Elizabeth Broun continued their relationship with Penn and the Penn Foundation, nurturing a partnership that stands as a classic example of how museums, curators, and artists can all benefit in today’s competitive art world. 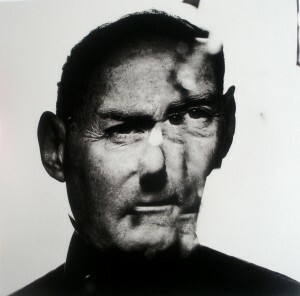 Right: Irving Penn in a Cracked Mirror, New York, 1986. Platinum/palladium print made 1990, 19 ½ x 19 1/2 “, Edition of 17. Promised Gift of The Irving Penn Foundation, 2013. 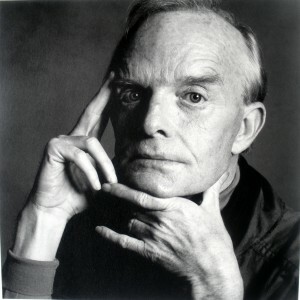 Born in 1917, Penn studied at the Pennsylvania Museum School of Industrial Art, where his advertising design teacher was Alexey Brodovitch, the art director of Harper’s Bazaar. Penn worked weekends and summers interning for Brodovitch at the magazine, and became his full-time assistant in 1938 during editor Carmel Snow’s heyday—years when Snow filled the magazine’s hallways with such extraordinary midcentury figures as Diana Vreeland, Louise Dahl-Wolfe, and Richard Avedon. 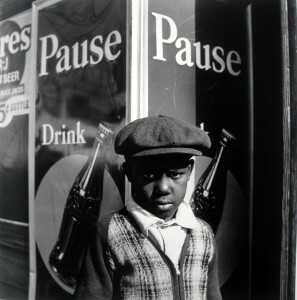 Left: Young Boy, Pause Pause, American South, 1941. Gelatin silver print made 2001, 11 x 10 ½”, Edition of 5. Gift of The Irving Penn Foundation, 2015. Penn had not taken up photography when he went to work at Harper’s, but soon bought a Rolleiflex camera and began wandering around New York taking street scene “camera notes.” According to curator Foresta, Eugene Atget was a formative influence that Penn discovered early in his photo adventures. Atget chronicled Paris street scenes from the 1890s until his death in 1927, and by the 1920s was receiving widespread attention from the Surrealists. He became well-known in America through such exhibitions as the Museum of Modern Art’s 1936 “Fantastic Art, Dada, Surrealism.” Although austere social documentary was a popular photographic style in the Depression, Penn found a kindred spirit in Atget’s more poetically-rendered approach to urban life. Right: Ball Dress by Oliver Theyskens for Nina Ricci, New York, 2007. Gelatin silver print made 2007, 19 x 19″, Edition of 11. Gift of The Irving Penn Foundation, 2014. A major purpose of this exhibition is to consider Irving Penn as he viewed himself–primarily as an artist rather than as a photographer. Trained in painting and drawing, he embraced photography as a fine art. 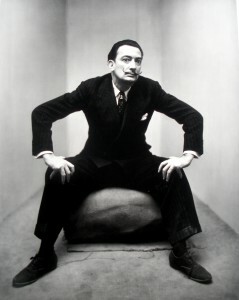 He actually left New York in 1941 to pursue his “need to paint” and headed to Mexico, which had become a cultural center for European intellectuals and artists displaced by war; in these years Mexico City notably hosted an ambitious version of the “International Surrealist Exhibition” that was earlier displayed at MoMA. Penn’s painting excursion failed to produce the canvases he had hoped for, but he returned with a portfolio of photographs made as he traveled by train from Mexico to New York. He went to work for art director Alexander Liberman at Vogue in 1943 and, except for a stint serving as an ambulance driver and photographer at the end of World War II, stayed for decades. Penn eventually published 160 Vogue covers; his subjects included fashion photos and portraits, dance photos, editorial still lifes, and ethnographic essays that marked a major photographic contribution to modern art. Left: Truman Capote, New York, 1979. Gelatin silver print made 1983, 10 9/16 x 10 3/8”, Edition of 4. Gift of The Irving Penn Foundation, 2015. The war years streamlined fashion and the fashion industry and boosted American design to the forefront. The tailored and sporty look introduced by such Hollywood designers as Adrian and Travis Banton was celebrated by Vogue editor-in-chief Edna Chase, who declared that “Dressiness is demode. It looks wrong to look wealthy. Understatement has a chic denied to overemphasis.” Liberman took this command literally and transformed the magazine, as Merry Foresta writes in her catalogue essay, “into something akin to a news magazine.” He used the same bold font as the New York Daily News and selected photographs that depicted people in Weegee-esque “gotcha” stances. 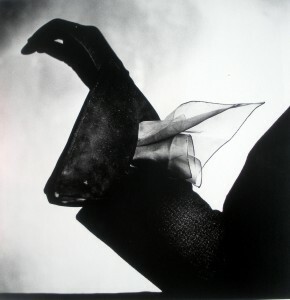 Right: Kerchief Glove (Dior), Paris, 1950. Gelatin silver print made 1984, 15 3/8 x 15 5/16”, Edition of 9. Promised Gift of The Irving Penn Foundation, 2013. Penn’s understated photographs became an essential element in Liberman’s “new look” for Vogue. 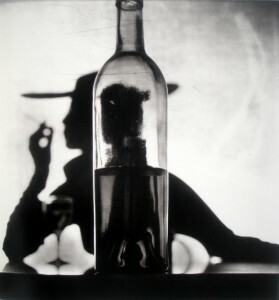 He elaborated his fascination with the still-life genre, creating what he called “situational” images that, as Foresta argues, “established a visual arena in which aesthetics and fashion could go toe-to-toe.” What these images also radiated was the sense of exactitude that Penn employed in all of his photographs, whether artistic fashion shots and portraits, or commercial work for such corporate brands as Jell-O and U.S. Steel. Left: Salvador Dali, New York, 1947. Gelatin silver print made about 1947, 9 7/8 x 7 15/16”, edition of 31. Gift of the artist, 1988. In the late 1940s, Penn began to construct his stripped-down “corner” portraits. He invited famous and near-famous people to pose in a corner made of plain studio flats: the format was minimalist and configured to reveal a subject’s uncluttered personality. Young Truman Capote seemed swallowed by an oversized coat as he tried to hide in the corner (not pictured), while Salvadore Dali’s enormous ego filled the entire space with exuberance. Penn made his name in the midcentury glory years of the fashion magazine trade—years, as all Mad Men fans know, that marked the height of commercial art’s impact on American life and culture. Yet he always maintained his commitment to photography as a fine art. 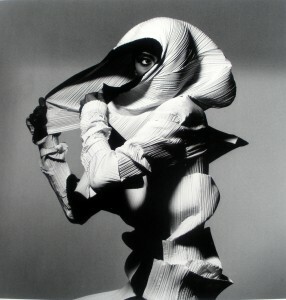 Right: Issay Miyake Fashion, Black and White, New York, 1990. Gelatin silver print made 1992, 15 x 14 3/4:, Edition of 6. Gift of The Irving Penn Foundation. Diana Vreeland’s enormous personality sparkled with Madison Avenue’s glitter, and when she came to Vogue in 1962, she brought her larger-than-life sensibility with her. Her favorite photographer, Richard Avedon, joined her in 1966; his photographs of Paris models leaping and spinning superbly matched Vreeland’s idea that the magazine needed to convey dynamism. 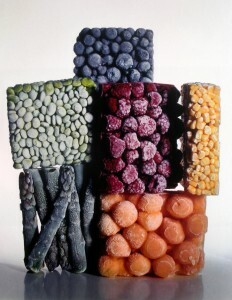 While Penn continued to work at Vogue, he began to focus more on his own studio work, especially focusing on such colorful still-lifes as cubes of frozen food. As time went on, he increasingly aimed for a photographic process that was “primarily simplification and elimination” and related “more to old painting and old sculpture”—that is, to fine art. Left: Frozen Foods, New York, 1977. Dye transfer print made 1984, 23 5/8 x 18 3/8″, Edition of 33, Gift of The Irving Penn Foundation, 2015. 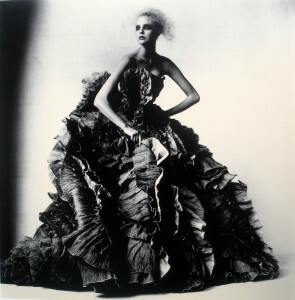 Irving Penn: Beyond Beauty will be at the Smithsonian American Art Museum until March 20, 2016; its current travel schedule include the Dallas Museum of Art, the Lesley University College of Art and Design, the Frist Center for the Visual Arts, and the Wichita Art Museum. The exhibition is accompanied by a catalogue ($45), co-published by The Irving Penn Foundation and the Smithsonian American Art Museum, and distributed by Yale University Press, with an essay by Merry Foresta and an introduction by Elizabeth Broun. Side Bar Image: Bee, (detail) New York, 1995. Chromogenic print made 2001, 21 3/8 x 24”, Edition of 15. Promised Gift of The Irving Penn Foundation, 2013. 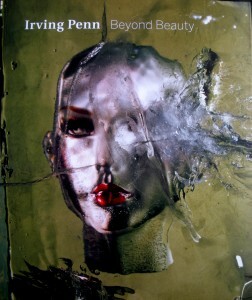 This exhibition does a great job of covering the entire scope of Irving Penn’s career. It always fascinates me how an artist evolves and resists repeating whatever seemed to work well at a particular moment: life goes on in a constant and renewing “present,” which is the place great artists always seem to capture and express.